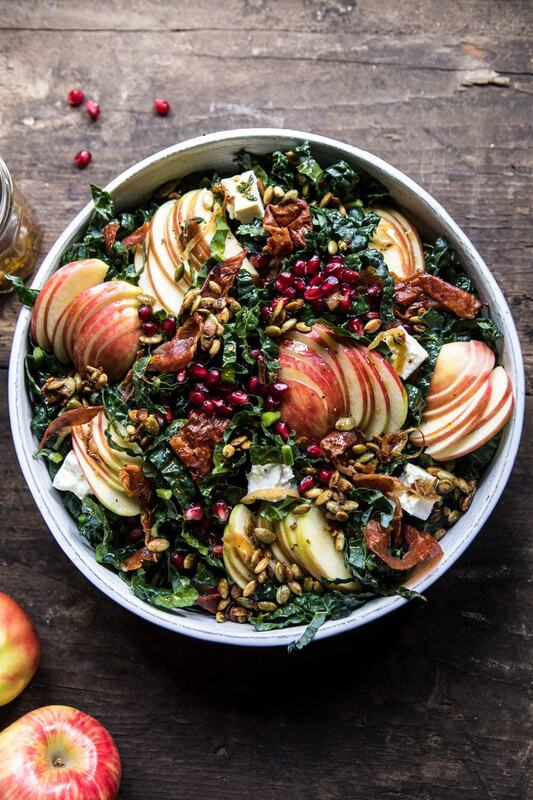 Fall Harvest Honeycrisp Apple and Kale Salad. 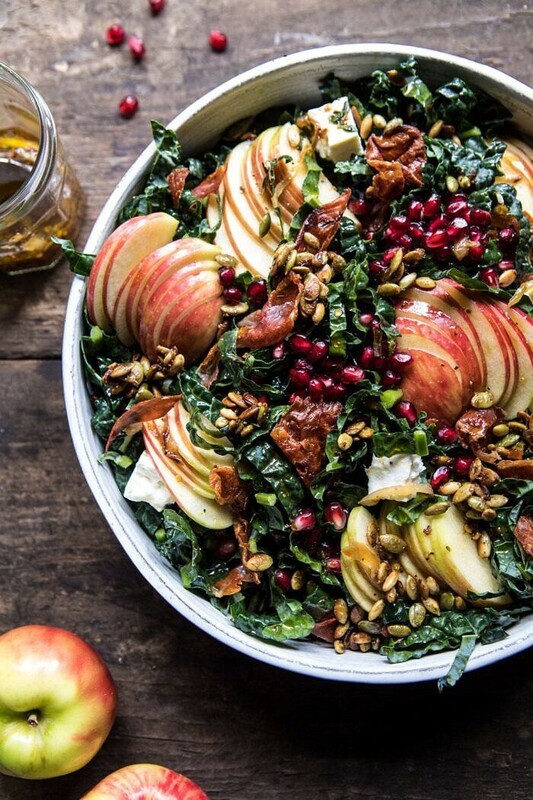 Fall Harvest Honeycrisp Apple and Kale Salad. All the best produce that fall has to offer combined into one big beautiful salad. 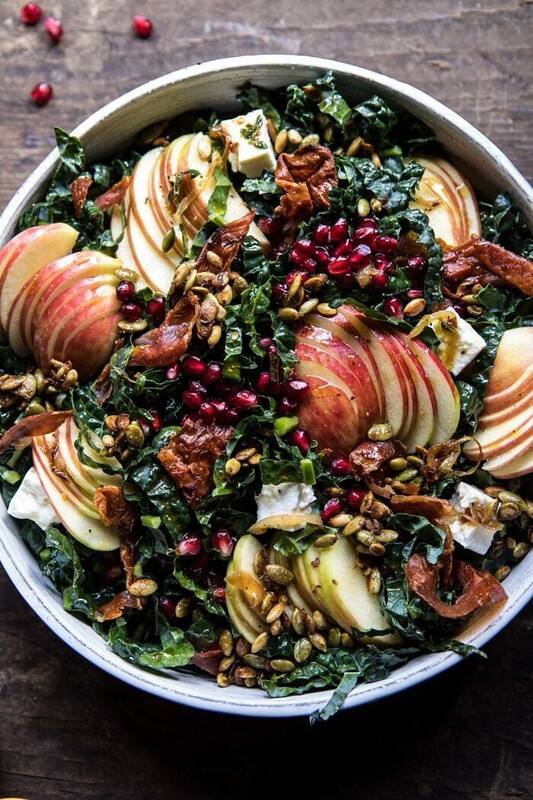 I could not love this combo of shredded kale, sweet honeycrisp apples, pomegranate, pumpkin seeds, and crispy prosciutto more. Tossed with a caramelized shallot vinaigrette, this salad is sure to become a new fall staple. Healthy, simple, delicious, and perfectly fitting for cool, crisp fall evenings. Technically fall doesn’t start until Saturday, but it’s pretty obvious that I am ready…and so very excited. However, what’s only recently obvious to me, is that after spending a couple of days in NYC this week, a lot of you are still experiencing summer like weather, even though we’re moving into late September. I spent all Monday and Tuesday in the city, and wow, it was incredibly humid, rainy, and dreary. My hair did not like it. And while it was totally fine for what I was doing (thankfully everything was inside), my flight was majorly delayed on the way home. Not sure what my deal is when flying out of NYC. But the last two times I’ve been in the city, it’s been slightly stressful trying to make it home. Last time my flight was cancelled and I had to spend an extra night in the city. This time I had an over three-hour flight delay. Ugh! It’s safe to say I am very glad to be home. I’m crossing my fingers for a lighter travel schedule over the next few months, as things are pretty busy around here. Plus, I love being home this time of year. It’s cozy and perfect, and I just need a couple of back to back weeks in my own bed, you know? Can you tell I’m not really a traveler at heart? The more and more I travel, the less I stress, and maybe even get used to it, BUT I will forever be a homebody at heart. Ok, enough about my travel, let’s get on to this salad. Fortunately, this salad is great no matter what season you’re currently experiencing, it’s a light option that still screams autumn. Personally, fall is my favorite time of year for salads. I know that most people would probably say that summer has their favorite produce. But in my opinion nothing beats the fall apples, squash, root vegetables, pumpkin, pomegranates, and figs. These are all my favorite produce, so making salads in the fall is a must. Today’s kale salad is fairly easy, but yet so full of flavor and texture. I am, of course, in love. The story with this salad is simple. I was sitting at my desk the other week when I realized that I hadn’t shared a salad in a while. I really just opened up my fridge, looked through my pantry, and started cooking. A lot times my best recipes are formed on the spot, and that was the case with this salad. Sometimes over thinking can be the killer of creativity, so when I’m lacking inspiration I’ll just grab what I have on hand and start cooking. More times than not it turns out really well! Luckily, I had everything I could have wanted to make an awesome salad and vinaigrette. OK, so maybe not the simplest mix, but it’s sooo good. Start off by roasting the pumpkin seeds (pepitas). This only takes about ten minutes, and you’ll be crisping up the prosciutto at the same time, so killing two birds with one stone (that’s honestly the weirdest saying ever, I don’t get it). While that’s happening in the oven, toss together the greens, apples, pomegranates, and feta. After that, it’s onto the vinaigrette. And you guys? The vinaigrette is what makes this salad. It’s all about the caramelized shallots and apple cider. I love tossing the still warm vinaigrette with the salad and then serving. It’s SO good and makes the salad feel heartier, which I love during the fall and winter months. I’ve now made this salad multiple over the last couple of weeks. The bonus? If you have any leftovers, they taste amazing the next day. 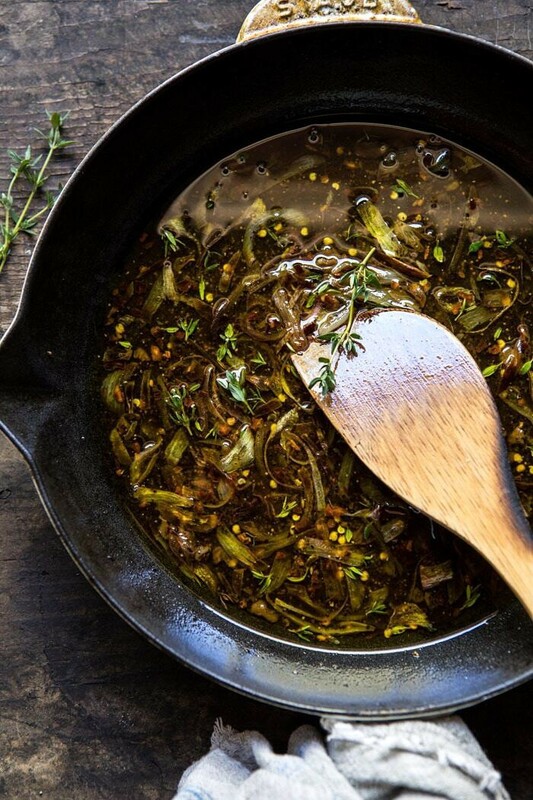 The kale has time to marinate in the vinaigrette, and honestly, the flavor actually gets better. Oh, and if you’re wondering if the roasted pumpkin seeds and crispy prosciutto are worth it, they are 100% worth it. Salty, sweet, and crunchy, these are the best finishing touches to a fall salad. 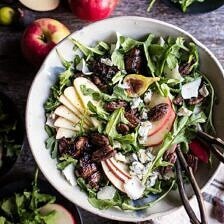 Honeycrisp Apple and Kale Salad_WEB from Half Baked Harvest on Vimeo. 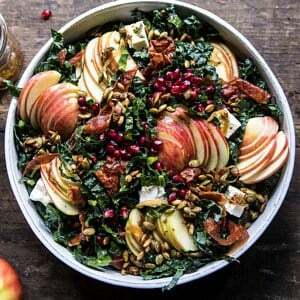 If you make this fall harvest honeycrisp apple and kale salad, please be sure to leave a comment and/or give this recipe a rating! Above all, I love hearing from you guys and always do my best to respond to each and every comment. And of course, if you do make this recipe, don’t forget to also tag me on Instagram! Looking through the photos of recipes you all have made is my favorite! All the best produce that fall has to offer combined into one big beautiful salad. 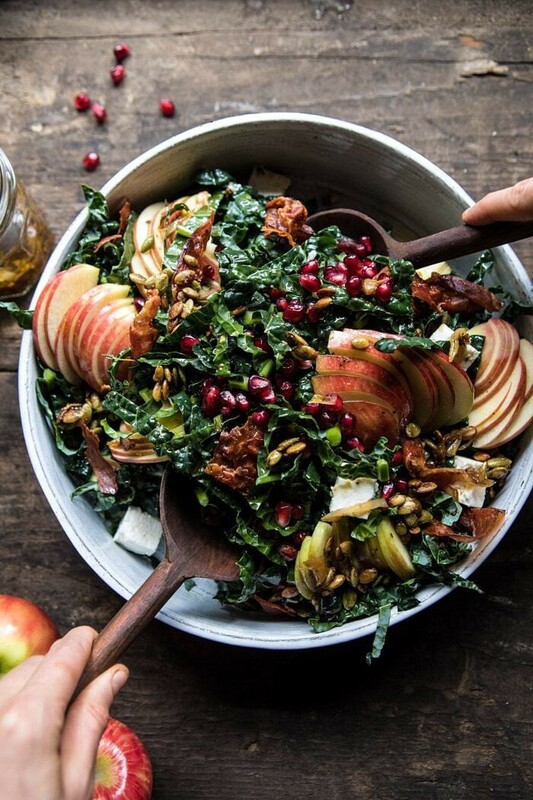 Shredded kale, sweet honeycrisp apples, pomegranate, pumpkin seeds, and crispy prosciutto. All tossed with a caramelized shallot vinaigrette. Healthy, simple and delicious, this salad is sure to become a new fall staple! 2. On the prepared baking sheet, toss together the pepitas, olive oil, maple syrup, cinnamon, and a pinch of salt. Arrange in a single layer. Lay the prosciutto flat around the pepitas. Transfer to the oven and bake for 10-15 minutes or until the pepitas are toasted and the prosciutto is crisp. 3. 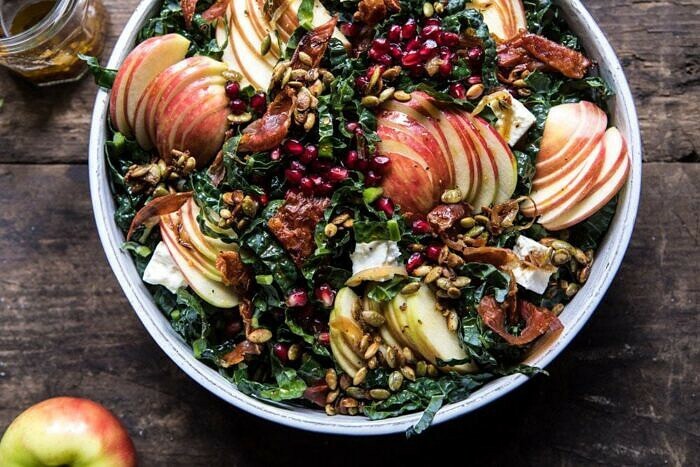 Meanwhile, in a large salad bowl, combine the kale, apples, and pomegranates. 4. To make the vinaigrette. Heat the olive oil in a medium skillet over high heat. When the oil shimmers, add the shallots, cook until fragrant, 2-3 minutes. Remove from the heat, let cool slightly. Add the apple cider vinegar, fig preserves, and thyme. Season with salt, pepper, and crushed red pepper flakes. 5. Pour the vinaigrette over the salad, tossing to combine. Top the salad with toasted pepitas, prosciutto, and feta. Eat and enjoy! 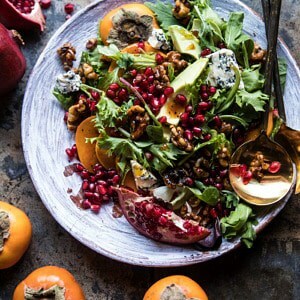 Pomegranate Avocado Salad with Candied Walnuts. Thank goodness you’re home sweet home! Tieghan, thank you for figuring dinner out again! Perfect side with grilled pork tenderloin. Beautiful, healthy and amazing as usual! it looks so good, I love kale. 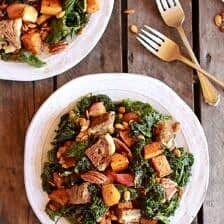 What a beautiful salad that screams fall!! I am so excited about pomegranate, but we don’t have them in stores yet, so I will have to skip them..
That sounds so amazing!! I love figs I think they’re so delicious! I hope you love this salad Nikki! You’ve made Kale look tasty…I didn’t know that was actually possible!! Haha I love that! Thank you Rebecca! There’s nothing better than a savory sweet salad! YUM! I love kale salads! If anything, heavily massaged kale has to be my favorite way of enjoying it. It’s been quite a while since I enjoyed a honeycrisp apple, which is something I DEFINITELY need to fix. Apples are delicious, after all! Another part I adore? This recipe was made out of pure spontaneity, yet it seemed like you had a whole blueprint! Thank you so much Cassie! I hope you love this if you try it! love this mix of ingredients, so creatively paired or grouped together, thank you for this wonderful salad! Awesome salad! There was ALOT going on with the flavors, but they all came together beautifully. It was well worth the effort! I subbed the kale for romaine as my husband doesn’t like kale. The romaine performed admirably under the weight of all the goodies topping it! I am so happy to hear that Sharon! Thank you! Is there a substitute if I can’t find fig preserves? This salad is delicious, but making the dressing made a huge mess of my kitchen. I took the oil/shallot mixture off the heat and added the apple cider vinegar. The oil started sputtering everywhere…all over the stove, counters, and floor. Did you let the oil cool completely before adding the other ingredients? If so, you may want to note that in the recipe to save other readers the cleanup. I made this recipe over the weekend and it was SOOOOOO good! We went apple picking and I made a 4 course apple meal including your apple chicken masala and this salad! Honestly this salad is so simple to make but so complex in taste! Great work-this will be a fall/winter staple in my house. YUM!! I am so glad you loved this salad.. I might just have to do a 4 course meal with apples soon! I made this this weekend – SO GOOD. I left out the meat (vegetarian here), added some shaved brussel sprouts, cubed and roasted butternut squash, and quinoa. I am in love with this and will be making it all fall and winter! Well this was part of my welcome fall dinner Sunday evening and it turned out great. Especially with smoked ribs, HBH herbed butter sweet potato fries. And your apple butter bars (twice in one week, don’t tell) to complete this very special dinner. Thanks Tieghan for continuing to get me to change up my repertoire. I love that! Thank you so much Karoline! Wow! I love kale salad, and this is the best I have ever made. The sweet, salty and tart flavors are perfect. I will be making this again! Thanks for the recipe! Keep them coming. Oh, wow. This salad is everything. I made it tonight for my husband and myself and we only have a small portion left over. I have already called dibs on it for breakfast (I’m thinking poached egg ontop). Well, tonight I veganized it for my husband—tempeh marinated in maple syrup, liquid smoke, apple cider vinegar, coconut oil, and ume plum vinegar. I also swapped vegan smoked moz for the feta, though it got lost in the salad and so I’ll probably just skip it next time. It came out divine! The pumpkin seeds and the dressing were absolutely the stars. Unfortunately, my stores don’t yet have pomegranates, but hopefully next time I make this they will. I foresee this salad being made bunches in the future! YUM! I am so glad you both loved this Theresa! Thank you! I think your fall salads are my favorite! I love Honeycrisp apples and this looks so delicious! It’s also very forgiving as well, I used walnuts instead of pepitas, cranberries instead of pomegranate, and omitted the cheese. I am so glad you loved this! Thank you Jess! Your salad looks amazing and can’t wait to try it. I was curious which type of Kale you used? Lacinto (Dino Kale)? Hi Karen! Yes, I used Dino Kale. I hope you love this salad! I brought this salad to a dinner party last night and it was such a hit! I made a double batch and it was completely gone before the night was over. Definitely going to become a standard that I keep going back to. The vinagrette is especially good! Wow I am so happy to hear that! Thank you so much Camille! Delicious! I left out the pepitas but other than that followed the recipe exactly. It was an amazing salad! excited to make this salad for tomorrow nights cookbook club our theme is half baked harvest! Wow that is so great! I hope this salad turns out amazing for you, please let me know! I don’t see the shallots on the ingredients list, how many should we prep for this recipe? Such an incredibly festive and elevated salad! I made this for a Friendsgiving party, and no one could stop RAVING about this salad (even with all the other amazing food!). Fairly certain you have at least 5 new followers 🙂 The colors and flavors were simply AMAZING- thank you for making salad SHINE! That is so amazing Toby! I am so glad everyone loved this salad and I hope you all love some other recipes on my blog! Thank you so much! I made this last night for our offering for my daughter’s preschool Thanksgiving feast today. It was amazing and everyone asked for the recipe. I made a double batch and left out the feta, pepitas, and prosciutto out of the one I took to the school and left out meat for the other. It was amazing! Thank you very much! I love your recipes. That is so amazing! I am so glad everyone loved this Candiss! Thank you! 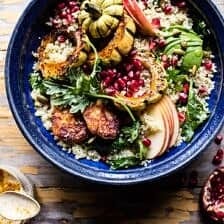 Will be making this recipe for thanksgiving but had a few questions! 1)Instead of 2 heads of kale can I replace with precut and washed bagged kale? If so how much would I need for the recipe? 2) Also is there a substitute for the fog preserves if I cannot find any? 3) if I’m making this to bring to bring to someone else’s for thanksgiving, do I make everything ahead of time and only mix it/combine it all right before dinner? 4) do I need to just use fresh sprigs of thyme or is there another way to purchase it for the dressing? 1. you can use pre-cute kale. I recommend 6 cups. 2. for the preserves, you can use apple butter or maple syrup. 3. You can toss the salad up to 6 hours ahead of time. or you can assemble the salad and then add the dressing just before serving either option works great! 4. you can use 1 teaspoon dried thyme if you would like. Made this for dinner, topped with roasted chicken breast – it was so delicious! I loved the candied pepitas and that shallot cider vinaigrette – yum! Thank you so much Korena! I am so glad you loved this salad! Thank you! We’ve made this salad four times in nearly as many weeks, and love every serving! Based on items available in the house, substituted filberts/hazelnuts for Pepitas and goat cheese for feta. Thanks for another stunning recipe! Thank you Sara! I am so glad you liked this recipe! This salad was INSANEly good!! It was a huge hit at Thanksgiving. I will be making this again! Made this tonight sans-cheese and it turned out so delicious!! I am so glad this turned out so amazing for you Stephanie! Thank you! I made this last night and it is absolutely delicious! What a great coating on the pepitas – I will be using that on all kinds of nuts. I used extra kale and doubled the dressing – a beautiful as well as delicious salad. Thank you so much Mimi! I am so glad this salad turned out so well for you! OK, so I couldn’t track down fig preserves (used apricot instead) and my arils went bad before I got the chance to make this, but…I don’t like salads and I’m eating the heck out of this one. The flavors are perfect, and I love that kale is sturdy enough to hold up for a few days. The dressing just soaks into the leaves and it’s delicious days after. So good! I am so glad you loved this recipe Teresa! Thank you! Made this for Thanksgiving thinking my teenagers wouldn’t eat it and I’d get most of it. They all ate it and I got no leftovers. They requested it for Christmas dinner! That is so amazing! I am so glad everyone loved this Emily! Thank you! My neighbor says he dreams about this salad! My husband has never had a kind word to say about kale lol and he also loves this salad! I rarely repeat recipes but have made this one three times in the last few weeks. Thank you so much Sandra! I am so glad you all loved this salad! I have made this twice now and I adore it! Different textures, playing with salty and sweet, fruit and veg together…..its brilliant! If you are hesitating because you think kale is weird in salads-trust me its the perfect base for this. It holds up to the warm dressing and its a nice hearty texture to carry all of the other ingredients. You can even eat this as leftovers and it will never get soggy. The warm dressing was such a great idea. I would not change a thing. Its so yummy. Hi Andrea! I am so glad this salad turned out amazing for you! Thank you so much for trying it! Really delicious salad that was popular across the table. We eliminated the figs as I’m not a big fan of that particular fruit, but it was so delicious even without. I have made this salad and dressing more than twice now, highly recommend! Thank you so much Christa! I am so glad you loved this! I finally had a chance to make this and I’m so glad—another winning salad, Tieghan! I am so glad you made this Yolanda! Thank you! I made this salad for New Year’s dinner, and it was delicious. Everyone loved it, and me more than anyone. It is crunchy and tasty and it feels so healthy. I have a question for you. I am going to make it again this weekend for friends who do not like feta cheese or blue cheese. Could I substitute good quality parmesan? Or what cheese would you suggest? I am thinking Brie could be an option, but it may be too strong for them as well. Suggestions? That vinaigrette! One way to get me to eat kale. I just made this and OMG delish! I didn’t have proscuitto so I used bacon, also I added a boiled egg since I didn’t (and don’t care for) feta. But geez that vinaigrette! Thank you!